Perry Block - Nouveau Old, Formerly Cute: First Contact! All throughout the world, they watched and they waited. 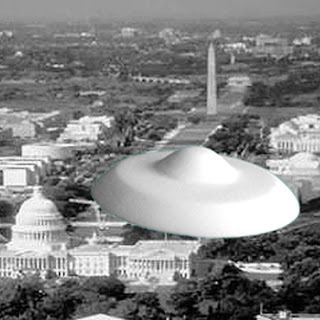 But in Washington D.C. they watched and waited ever more intently than anywhere else on Earth, for it was over Washington, the seat of authority of the most powerful nation on the planet, that the silvery disc hovered. Then, less than one hour before it had first come into view by the human eye, the craft gently lowered itself onto the White House lawn. As tens of thousands gaped in astonishment through the gates surrounding the home of the President of the United States, both the President and Vice-President --- flanked by top level aides and legions of security personnel --- made their way to the mysterious vessel before them. Then, they too watched and waited. An opening appeared in the silvery disc and through it walked two figures. They were humanoid, but like nothing ever seen before in our world, like nothing ever seen before by mankind. "Welcome to the planet Earth," said the President, slowly and deliberately. "I am President Barack Obama." The aliens looked at one another but spoke nothing at all. "This much older man with the bad hair transplant is Vice-President Joe Biden," added the President. All around the globe, people hoped and prayed. "Oh my yes!" gushed Vice-President Biden. "It's wonderful, and Anne Hathaway is a revelation!" "I knew it, Bort!" shouted the alien. "Knew it would be epic!" "Can we see it right away, Klabu?" said the other alien. Can we? CAN WE?" "I don't understand!" said the President of the United States. "You've come all this way to see Les Miz?" "Of course, everyone loves Les Miz! Why look at Bort, breaking into the show stopper!" And their words inviting ...."
"Mr. Klabu, please! We must talk with you, learn from you! You'll meet our leaders, speak before our UN, you'll ..."
"No, thanks. Gotta bolt right after the flick." "Because we have dinner and a show on Alderon 7. Heard their revival of Cats is awesome! and get us some popcorn!" Branching our into Science Fiction? Love it. Thanks, Doug, but it's "Les Miz" that you must truly love. I hear that Xontar Rogas from Alderon 7 is almost as good a Jean Valjean as Hugh Jackman! Do they have an awesome retirement plan on their planet or does their government sponsor inter-galatic trips to the movies? Inquiring minds want to know. It's kind of Logan's Run type of retirement plan, I understand. You and I better stick to someplace in Florida.